It’s fundraising time! Please help Bill & Animal Haven! Yesterday we announced our new foster dog, My Boy Bill. As you recall, Bill had some serious medical issues that cost quite a bit of money to have resolved. Animal Haven, the shelter that rescued Bill graciously covered all of his medical costs, and now we would like to help them rebuild their Recovery Road Fund so that they have the resources to help more animals in the future. 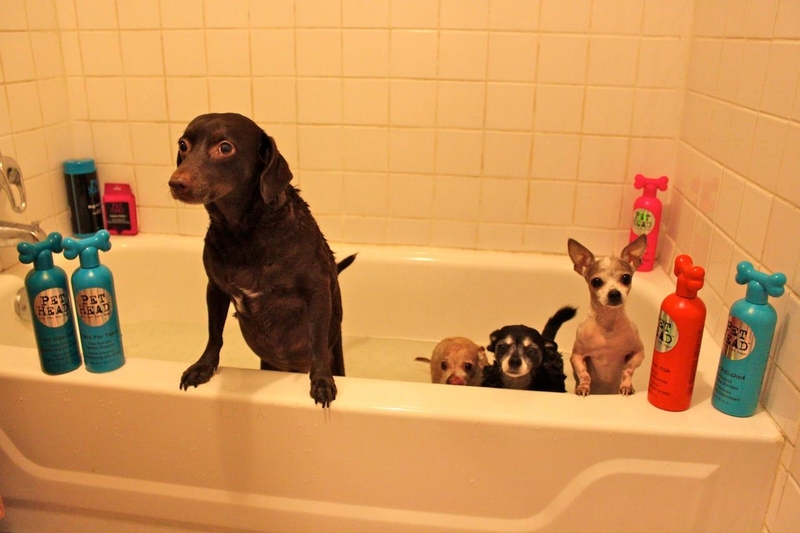 Donations can be made on our personal fundraising page on Animal Haven’s website. All entries will be entered into an online randomizer, and winners will be chosen on the day after Thanksgiving (aka Black Friday, aka Friday, November 25th). Prizes will be assigned to each winner in the following order. We’ve got some great stuff – so if you’re a household with pets, we know all of these prizes will appeal to you! One winner will receive a brand new martingale style collar in the fabric and size of their choice from Sirius Republic. Lucy & Bill both wear collars from Sirius Republic, and ever since they started wearing them, we have gotten more compliments on the street than ever before. Check out their website to view which fabrics are available and how to measure for sizing. What’s more is that Sirius Republic generously donates a portion of their proceeds to several rescue organizations, and even embroiders their collars with the words “ADOPT ME” for free for us foster parents, so you should definitely Like them on Facebook. One winner will win a selection of products from Pet Head. Pet Head creates high quality grooming products for dogs that I have used on all of my dogs. They have been incredibly generous and supportive of my efforts in pit bull rescue, and are huge supporters of rescue and adoption in general. We hope you’ll check out their website and Like them on Facebook, too. They provided a prize package for the last fundraiser I held, too, and here’s a photo of the pups (some of the best Chihuahuas we know!) who won that package. 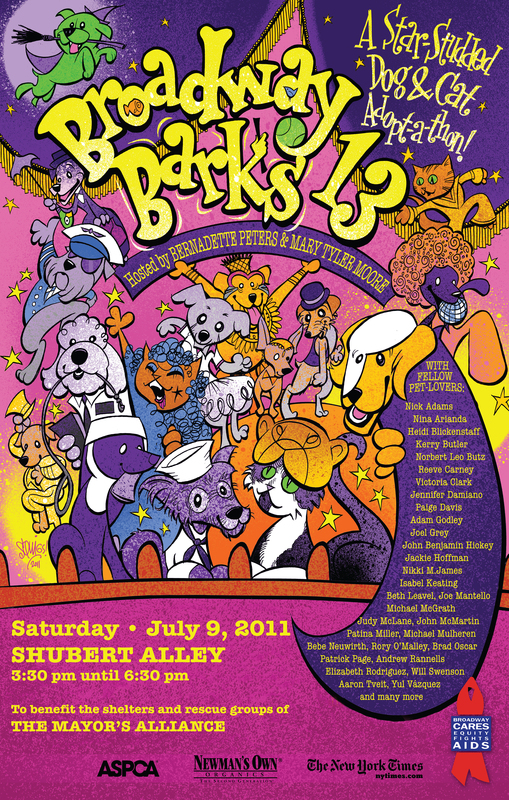 One winner will receive a prize package of gifts from Broadway & TV star and animal rescue advocate & pittie-lover, Bernadette Peters! Ms. Peters is currently starring on Broadway as Sally Durant in the hit revival of Stephen Sondheim’s Follies. 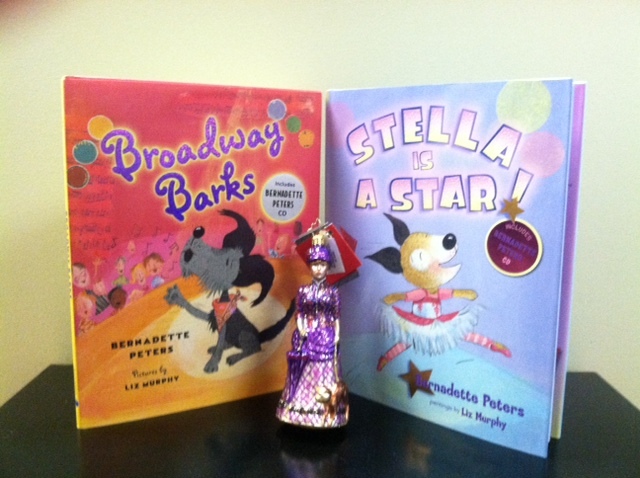 This prize package includes one copy of each of Ms. Peters’ books, Broadway Barks and Stella is a Star!, both signed by Ms. Peters herself, AND a holiday ornament based on Ms. Peters’ character Dot in the original Broadway production of another Stephen Sondheim musical, Sunday in the Park with George. Very special thanks to Broadway Cares/Equity Fights AIDS for providing this great prize package. For more information, please check out his website and Like him on Facebook. The winner of this prize will need to provide a few photos of their chosen pet so that Squigs can get a good idea of who your pet is and what he/she looks like. Because of Squigs’ schedule, it may take up to six weeks before your one-of-a-kind drawing arrives at your doorstep – but we promise that it will be worth the wait! One lucky winner will win a short photo shoot for their pet with The Phantom of the Opera. Now, obviously, because the Phantom lives in New York City, this winner will have to live here as well. 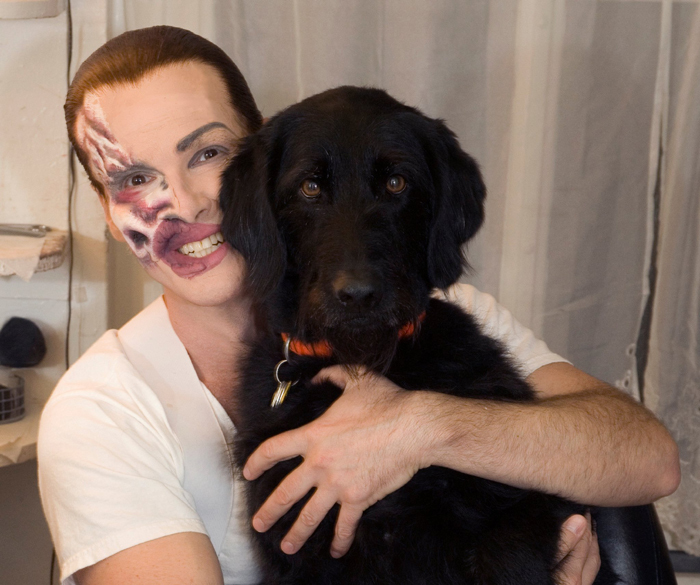 At a mutually agreeable time for both you and the Phantom (currently played on Broadway by animal-lover Hugh Panaro), he will invite you backstage at the Majestic Theater on Broadway, where you most likely will also meet his dog, Soot. So please check out Bill’s story, and donate to our fundraiser so that Animal Haven can continue the amazing work that they do. And if you know anyone who’s looking for a top-notch pooch, Bill is now officially adoptable and looking for his forever home!